While a local tragedy drew national media attention, our providers stepped up to save lives. Welcome to the fall edition of Academic Matters, the e-newsletter of the University of Florida College of Medicine – Jacksonville. Several weeks ago, our health system found itself in the national spotlight following the mass casualty event at the Jacksonville Landing. Six of the shooting victims were rushed to our hospital, where they received care for a myriad of injuries, some of which were life-threatening. As always, the emergency and trauma teams at UF Health Jacksonville — along with physicians and staff from various other departments — stepped up and answered the call to save lives and provide comfort in a time of pain, stress and uncertainty. This is part of the mission we pursue every day. We don’t do it for the accolades or attention. 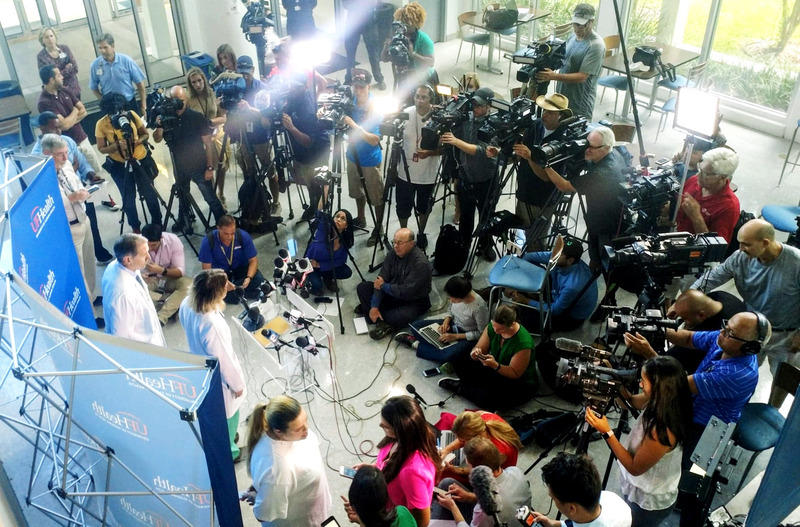 However, given the nature of this particular tragedy, news media crews from around the country descended on our hospital to report on the incident and hear about the care the victims received. News crews from around the country descended on UF Health Jacksonville to report on the Jacksonville Landing mass shooting and hear about the care the victims received. Standing before a sea of cameras, lights and microphones, Marie Crandall, M.D., M.P.H., a professor of surgery, and David Caro, M.D., an associate professor of emergency medicine, provided those updates and, in the process, represented us wonderfully during what was the largest press conference we’ve had on our campus in years. 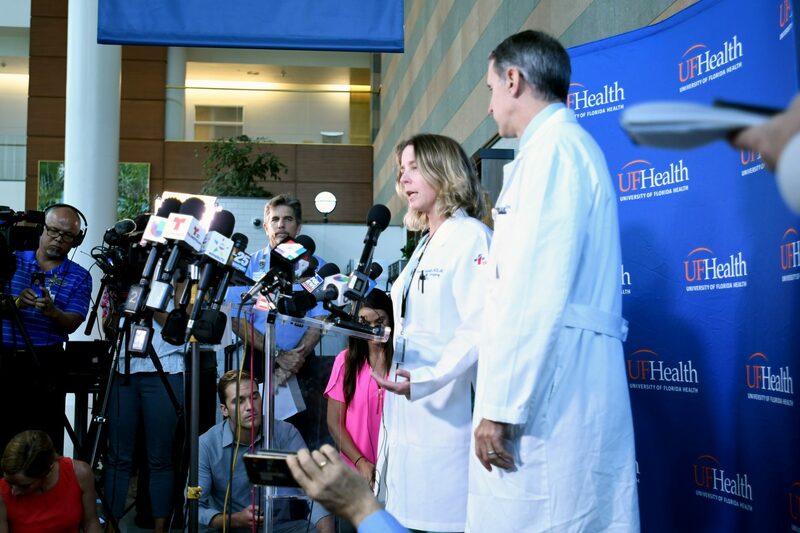 Via the media, millions of people across the U.S. and beyond heard part of the UF Health story, a story we continue to tell through compassionate care, education and discovery. The professionalism, expertise, passion and true concern for patients are evident. In emergencies, these qualities are of paramount importance. We hate when tragedies occur. But in those moments, it’s good to know we have experienced, skilled teams ready to provide the best care possible for anyone who comes through our doors. I could not have been prouder of our response. 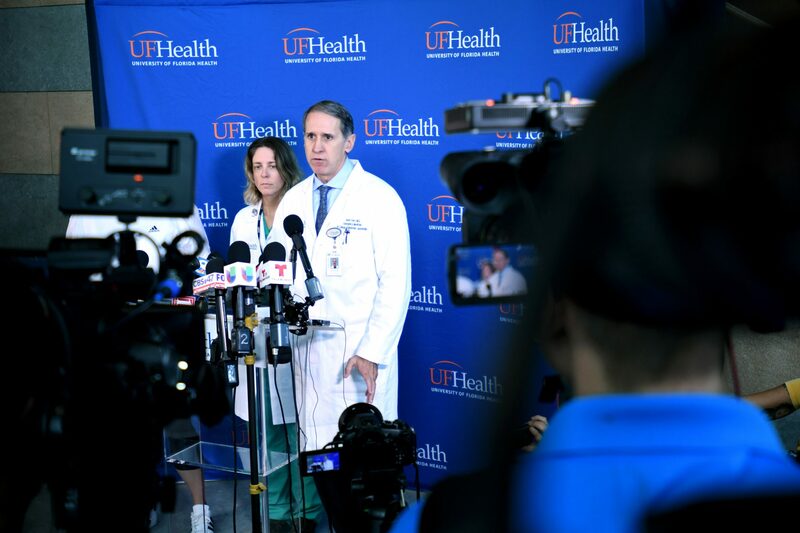 David Caro, M.D., an associate professor of emergency medicine at UF COMJ, talks to the media about the shooting victims who were brought to UF Health Jacksonville. 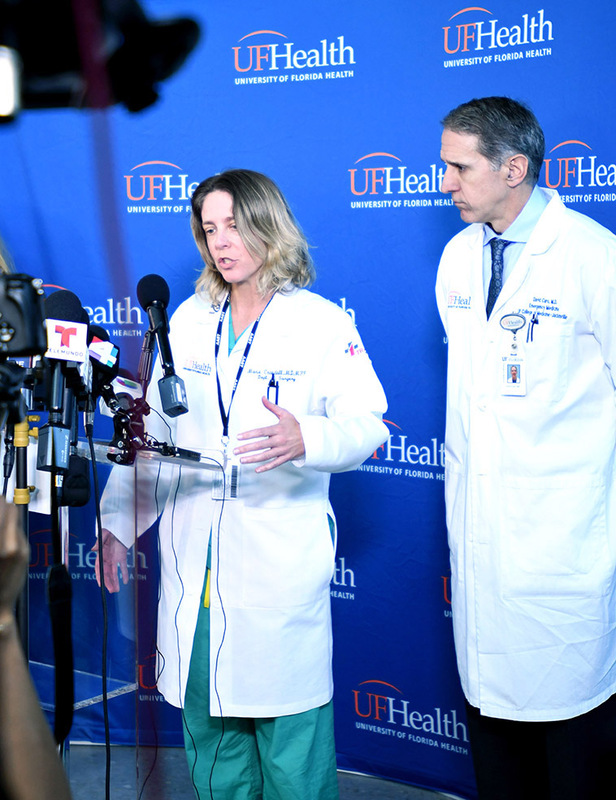 Marie Crandall, M.D., M.P.H., a professor of surgery at UF COMJ, updates the media on the patients' conditions. Speaking of trauma care, in August, UF Health TraumaOne received official verification from the American College of Surgeons. This is a distinction given only to trauma centers that meet the most stringent criteria. States designate trauma centers and the American College of Surgeons verifies them. We are just the eighth verified trauma center in Florida and remain this region’s only adult and pediatric Level I trauma center. The closest verified Level I trauma centers in Florida are in the Tampa and Miami areas. Much expectation comes with verification. This accolade reflects our readiness and dedication to continuously improving systems and infrastructure, all in an effort to provide extraordinary trauma care. Thank you and congratulations to everyone involved in the verification process. UF Health Jacksonville is home to TraumaOne, the only adult and pediatric Level I trauma center in Northeast Florida and Southeast Georgia. Also in August, we held a groundbreaking ceremony for our comprehensive medical office building at the Wildlight community under development in neighboring Nassau County. With 40,000 square feet of office and medical space, this facility will be used for primary care, imaging services, pediatrics, obstetrics and gynecology, mental health services, dentistry and a laboratory. Later on, other specialties, such as sports medicine and orthopaedics, may come into the fold. We expect to open in November 2019. UF Health and the University of Florida are the official health and wellness providers for Wildlight, which is being developed by Raydient Places + Properties. Future plans there include a UF Health Wellness Center that will feature UF Health rehabilitation services and a YMCA. 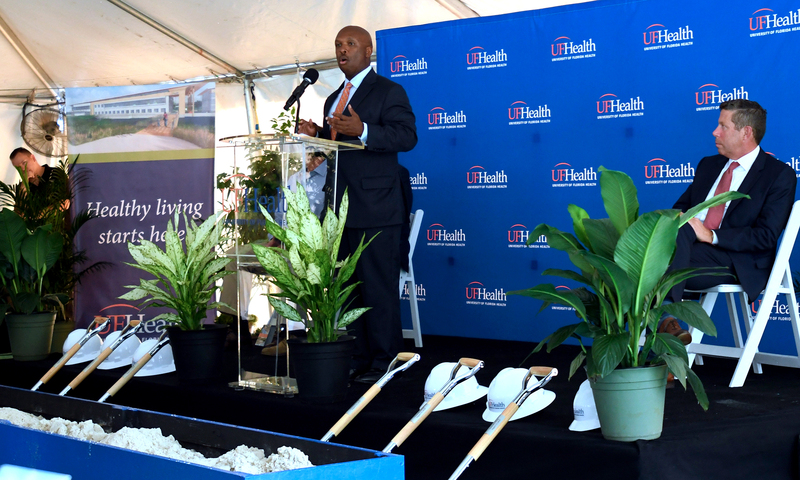 Leon L. Haley Jr., M.D., MHSA, dean of UF COMJ and CEO of UF Health Jacksonville, addresses the crowd during the Wildlight groundbreaking ceremony. 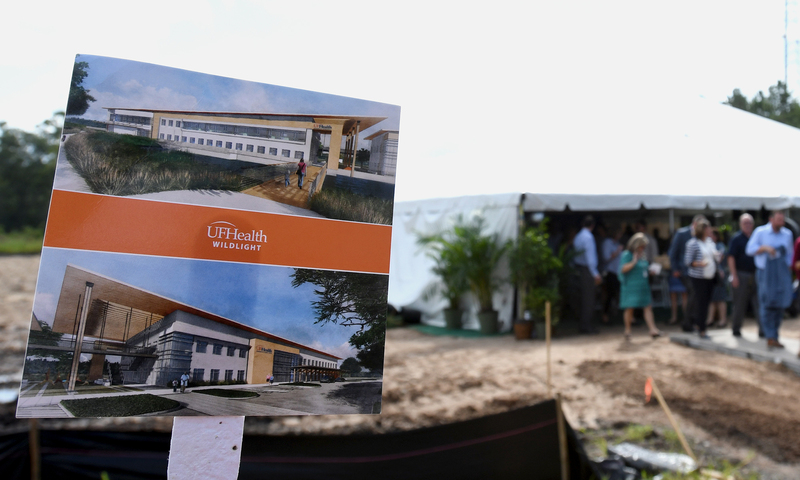 UF Health will have office and medical space at Wildlight, as well as a wellness center that will feature UF Health rehabilitation services and a YMCA. The UF College of Medicine – Jacksonville leadership team has almost taken full shape. On Oct. 1, we welcomed Alex Parker, Ph.D., as the new senior associate dean for research and Darrell WuDunn, M.D., Ph.D., as the new chair of ophthalmology. Dr. Parker comes from Mayo Clinic Jacksonville, where he served as a professor of epidemiology and urology and vice chair of health sciences research. Dr. WuDunn comes from Indiana University, where he served as a professor of ophthalmology and director of the ophthalmology residency program. We are pleased to have both of them here. Meanwhile, we have selected John Davis, M.D., as the new chair of obstetrics and gynecology. Dr. Davis will come over from the UF campus in Gainesville, where he has served as director of the obstetrics and gynecology residency program. He’s replacing Guy Benrubi, M.D., who has stepped down from his COMJ leadership roles to take a six-month sabbatical. Andrew Kaunitz, M.D., is chairing the department in an interim capacity until Dr. Davis arrives in January. Our final chair position to fill is neurosurgery, and we expect to make an announcement soon. Upon my arrival in 2017, the UF COMJ Faculty Council and the Office of Educational Affairs approached me about a request for us to become an Association of American Medical Colleges-recognized regional medical campus. We are considered an affiliate campus for UF medical students from Gainesville, who complete some of their rotations here. AAMC designation would require us to maintain a cohort of students who spend their entire third and fourth years of medical school on our campus. We believe our campus has the clinical expertise, dedicated educators and unique academic infrastructure in an urban environment to complement the student experience in Gainesville. As we continue to position ourselves as a key part of one of the best academic health centers in the Southeast, a regional campus designation is only fitting. David R. Nelson, M.D., interim senior vice president for health affairs at UF and president of UF Health, and J. Adrian Tyndall, M.D., M.P.H., interim dean of the UF College of Medicine in Gainesville, are now reviewing our proposal. We hope to report good news in the near future. "As we continue to position ourselves as a key part of one of the best academic health centers in the Southeast, a regional campus designation is only fitting." 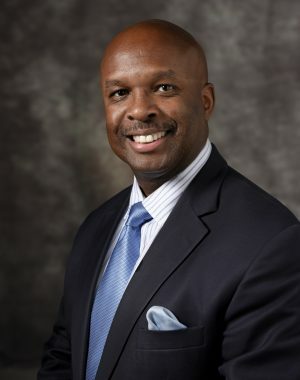 Leon L. Haley Jr., M.D., M.H.S.A., FACEP, CPE, is vice president for health affairs at the University of Florida, dean of the UF College of Medicine – Jacksonville and a professor of emergency medicine. Haley, who joined UF in January 2017, previously served as a professor of emergency medicine and executive associate dean at Emory University, and chief medical officer of the Emory Medical Care Foundation in Atlanta. Haley also formerly served as deputy senior vice president of medical affairs, chief of emergency medicine for Grady Health System and vice chair of emergency medicine at Emory University. Prior to his positions at Grady and Emory, Haley was a senior staff physician at the Henry Ford Health System in Detroit. Haley completed his undergraduate degree from Brown University in Providence, Rhode Island. He earned his medical degree from the University of Pittsburgh and a Master of Health Service Administration from the University of Michigan in Ann Arbor, Michigan. Haley completed his residency in emergency medicine at the Henry Ford Health System in Detroit, serving a year as chief resident.